An off-white, ready mixed polymer based, thin bed tile adhesive for use with ceramic wall tiles. 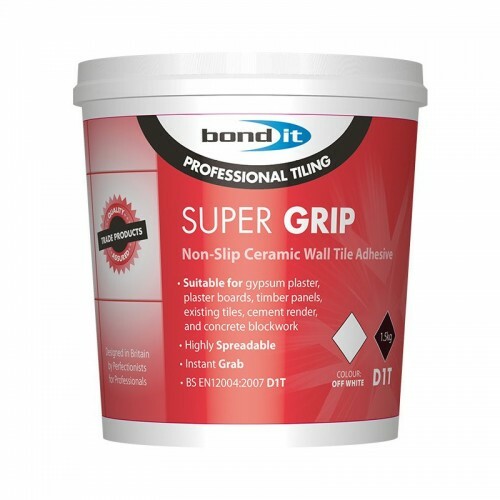 Has excellent grip properties, which reduces or eliminates the need for battens or spacers. It provides the user with an easy to apply, general purpose adhesive with spreading characteristics, which suit both the DIY and professional user. CE Approved: Conforms to EN12004 Type D, Class 1T. Suitable for fixing all types of ceramic wall tiles, including mosaics and vitrified tiles in interior locations such as kitchens, bathrooms, etc, provided it is used with a waterproof grout. It embodies unique 'non-slip' properties but allows for adjustment while fixing; in most cases this eliminates the use of battens. Note: It is unsuitable for swimming pools or where prolonged wet conditions exist. It should also not be used with porcelain tiles or in areas subject to rising or penetrating damp. Not suitable for use with large format tiles.